LONDON (AP) Four sweeps in four consecutive Olympics: That's the goal for Russia Friday in the free routine of the synchronized swimming team event. Natalia Ishchenko and Svetlana Romashina already secured gold for Russia in the duet event at the London Games, and the Russians lead the team event following Thursday's technical routines. "Everybody expects us to win gold and it is a lot of pressure," Romashina said. "They also forget that silver and bronze are medals, too." It began more than a century ago with a woman performing in a tank at the New York Hippodrome. Today, it is an exhibition of poise, precision and artistry. One of just two sports that are competed exclusively by women, synchronized swimming requires the athleticism to stay afloat while doing gymnastics in a pool and the perfect timing to hit a mark while it's all going on. Take a look at synchro's techniques and positions, and see how it has evolved from entertainment sideshow to Olympic glory. 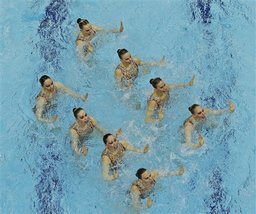 Synchronized Swimming Events for the 2012 London Games have been completed.